Over multiple decades this continuing accumulation of snow results in the presence of a large enough mass of snow for the metamorphism from snow to glacier ice process to begin. Glaciers are classified by their size (i.e. ice sheet, ice cap, valley glacier, cirque glacier), location, and thermal regime (i.e., polar vs. temperate). Glaciers are sensitive indicators of changing climate. 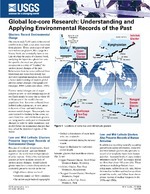 How long can we expect the present Interglacial period to last? Are today's glaciers leftovers from the Pleistocene ice age? Was all of Alaska covered by glaciers during the Pleistocene Ice Age? No--most of interior Alaska, south of the Brooks Range and north of the Alaska Range, was a non-glaciated grassland refuge habitat for a number of plant and animal species during the maximum Pleistocene glaciation. This ice-free corridor also provided one route for humans to move into North America. How much of the Earth's water is stored in glaciers? 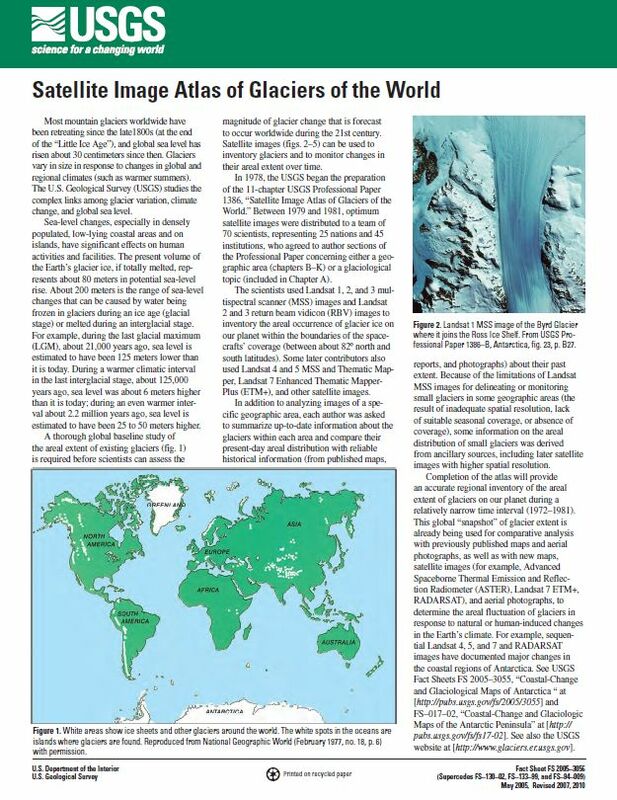 Where are Earth’s glaciers located? Glaciers exist on every continent except Australia. Approximate distribution is: 91% in Antarctica 8% in Greenland Less than 0.5% in North America (about 0.1% in Alaska) 0.2% in Asia Less than 0.1% is in South America, Europe, Africa, New Zealand, and Irian Jaya. 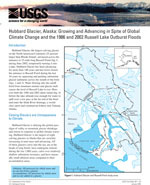 Trabant, Dennis C.; March, Rod S.; Thomas, Donald S.
Hubbard Glacier, Alaska: growing and advancing in spite of global climate change and the 1986 and 2002 Russell Lake outburst floods; 2003; FS; 001-03; Trabant, Dennis C.; March, Rod S.; Thomas, Donald S.
Cecil, L. DeWayne; Green, Jaromy R.; Naftz, David L.
Global ice-core research: Understanding and applying environmental records of the past; 2000; FS; 003-00; Cecil, L. DeWayne; Green, Jaromy R.; Naftz, David L.
Fountain, Andrew G.; Krimmel, Robert M.; Trabant, Dennis C.
A strategy for monitoring glaciers; 1997; CIR; 1132; Fountain, Andrew G.; Krimmel, Robert M.; Trabant, Dennis C.
Columbia Glacier, Alaska; research on tidewater glaciers; 1996; FS; 091-96; Krimmel, Robert M.
Glaciers that lose their footing on the seafloor and begin floating behave very erratically, according to a new study published in the journal Geophysical Research Letters. Floating glaciers produce larger icebergs than their grounded cousins and do so at unpredictable intervals. A report on long-term glacier measurements released today by Secretary of the Interior Ken Salazar shows that glaciers are dramatically changing in mass, length and thickness as a result of climate change. 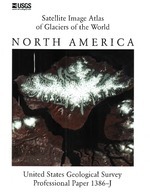 Most glaciers in every mountain range and island group in Alaska are experiencing significant retreat, thinning or stagnation, especially glaciers at lower elevations, according to a new book published by the U.S. Geological Survey. In places, these changes began as early as the middle of the 18th century. The great majority of the world’s glaciers appear to be declining at rates equal to or greater than long-established trends, according to early results from a joint NASA and United States Geological Survey (USGS) project designed to provide a global assessment of glaciers. At the same time, a small minority of glaciers are advancing. Torrents of meltwater are unleashed suddenly from the margins of the great moving sheets of snow and ice, known as glaciers. 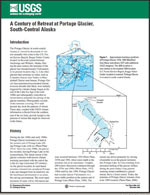 In Alaska, these pulses of activity, called "outburst floods," are usually caused by the failure of ice dams that restrain the meltwater of glacial margin lakes. Endpoint of Mendenhall Glacier, Juneau, United States. A new rift is forming across the Petermann Glacier. If this rift connects to existing rifts, it could result in another large iceberg breaking free. These Landsat 8 images show the latest iceberg to break free in Antarctica's Pine Island. Warmer ocean waters are melting the ice from beneath, causing increasing instability. Getting the Shot, Grinnell Glacier, Glacier National Park. USGS scientist shoots a repeat photograph of Grinnell Glacier in Glacier National Park to illustrate glacial recession due to impacts of climate change. *note – logo on scientists hat is logo from USGS Northern Rocky Mountain Science Center, not private. 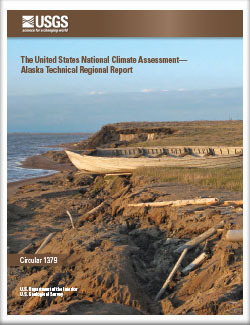 USGS Public Lecture Series: Baked Alaska--What's Happening to the Glaciers in Alaska? Glaciers are Earth's largest reservoir of freshwater. As they change, so does global sea level. Alaska has one of the largest accumulations of glaciers anywhere on Earth outside of the Polar regions. 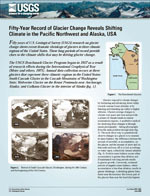 For most of the past half century, Alaska has experienced a significant increase in temperature that has profoundly impacted its glaciers. 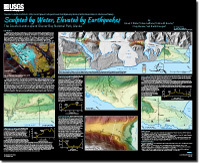 Join USGS scientist Dr. Bruce F.
Surprise Glacier, Harriman Fiord, western Prince William Sound. Surprise Glacier (in background), Harriman Fiord, western Prince William Sound. Barry Glacier, Barry Arm, western Prince William Sound. Oblique aerial photograph that shows the terminus of Bear Glacier, Kenai Mountains, Kenai Fjords National Park, Alaska.